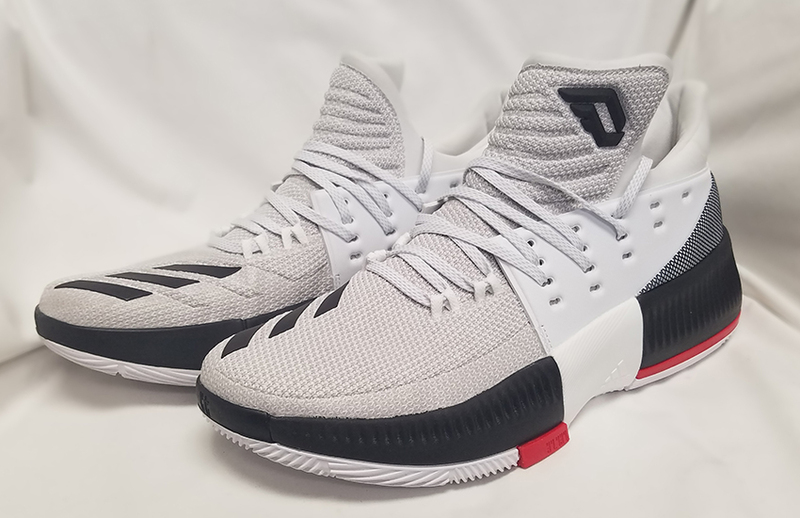 Just like Dame and the Blazers’ unexpectedly great run in the 2015-2016 season, last year’s Adidas Lillard 2 took the sneaker world by surprise with its balance of comfort, performance and value. With greater expectations this year, how does the Dame 3 stack up? The biggest weakness of the Lillard 2 was its traction on dusty floors. Due to its very closely packed grooves, dust would get stuck inside the grooves which would cause the shoe to get slippery on dusty floors. 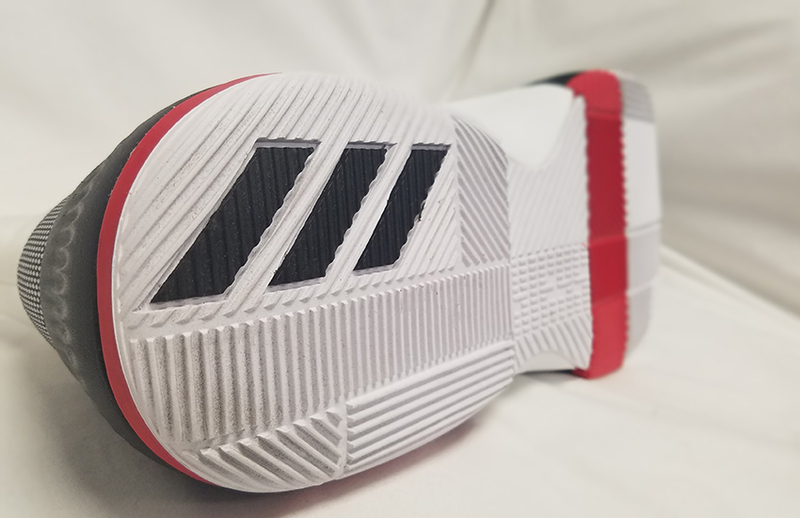 Don’t say companies don’t listen to user feedback, as adidas addressed this problem with a new multi-directional blade pattern on the Lillard 3, and it works wonderfully. Even on a mix of floors, from pristine to dusty, never-cleaned 24 Hour Fitness floors, the Lillard 3 retained a death grip on the grimiest of floors with minimal wiping. The combination of deep grooves, more spacing and soft rubber helped deliver consistent sticky traction. Bounce is back again on the Lillard 3, but it feels a little firmer and lower to the ground, especially in the forefoot. Bounce appears to need more volume to retain that bouncy feeling that felt so good on the Lillard 2. For those expecting the same cushioning feel as last year’s model, you may be disappointed. If a number had to be given, it would be like 10-20 percent firmer. However, the upside to the firmer setup is more court feel, responsiveness and an overall quicker feeling. For those fretting about why Boost wasn’t used, keep in mind that as popular as Boost might be to consumers and the marketplace, it’s not the end-all, be-all. Adidas is giving hoopers options, from both a performance and price point perspective. 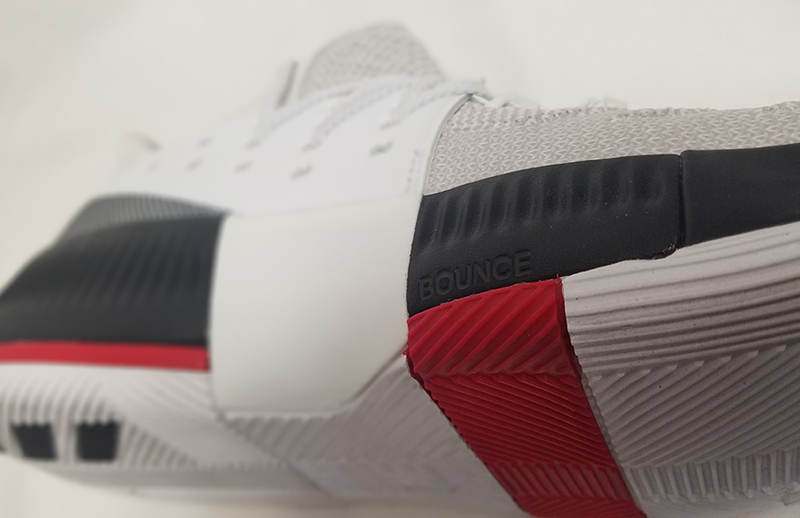 Not all players like the sensation of Boost on a basketball shoe, so the use of Bounce is a good alternative. Its firm cushioning in a less expensive setup is a good choice for those not looking to pay the Boost premium. As a general rule, adidas basketball offerings run about half a size larger than Nike models, and the Dame 3 is no different. If you have wide feet, you can go true to size depending on preference, although I stuck to half a size down for a little tighter fit. 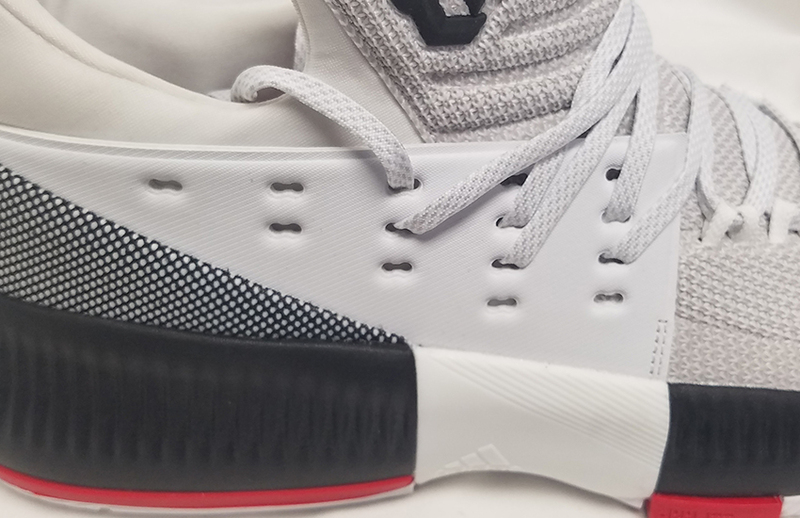 The big talking point of the Dame 3 is the pegboard lacing system, which is supposed to allow the player to customize the fit. I found that the front two rows of eyelets didn’t really affect the fit. since they pull down on the pegboard no matter the position. On the other hand, the back three eyelets affect how the heel and ankle are pulled back. I had serious heel slip in the out of the box neutral position, some heel slip in the second back and down and some light slip in the rearmost eyelet. To comfortably use the rear eyelet, I had to skip a row of eyelets, so I bought 72-inch laces to utilize every row and it helped with lockdown, although I still had some minute heel slip during play. One other issue I had with using the rear eyelet was lace pressure due to a lack of padding around the ankle collar. More padding or a traditional tongue would have helped with the overall comfort of the Dame 3. 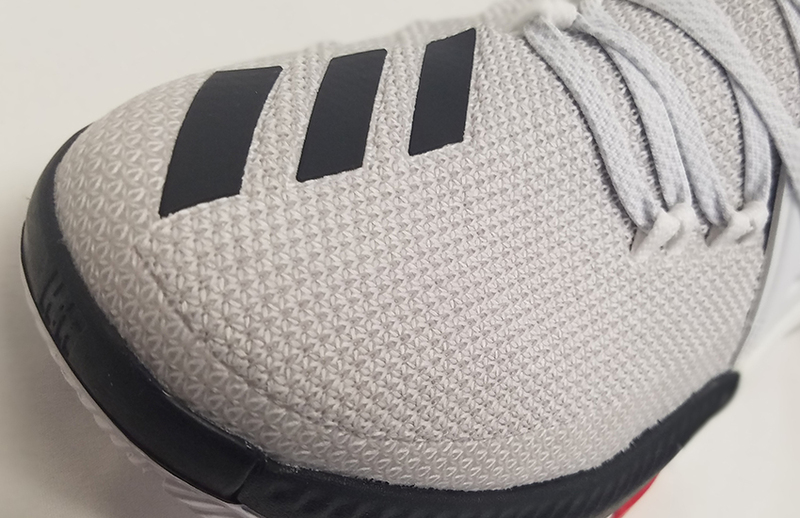 Overall, the last three eyelet rows of the pegboard affect the fit, but adidas could have just made a more efficient one-size-fits-all lace setup or just added a few extra eyelets around the ankle to be more efficient with modularity. Adidas calls this upper material Fused Mesh, which is rough mesh with fused portions for strength. It is soft where it should be for flexibility and stiff where it should be for strength. While it isn’t the softest or most luxurious material (it has a similar hand as burlap), it works just fine with no pinching or hotspots. It might feel and look stiff, but even on the first wear, it flexes with the foot. Although the Dame 3 is a high low top, the support and stability is fantastic. The majority of the support comes from the fit and the firm external and internal heel counter. In addition to protecting your foot from ankle sprains, the Dame 3 midfoot support is very good, almost to its detriment. This midfoot structure is very firm and doesn’t allow for any flexing from the midfoot and back. It feels a bit unnatural at first, but the upside is you won’t get any unnatural or over down flexing, which is great for plantar fasciitis sufferers. Stability is also excellent, with a very flat outsole in combination with the rectangular outrigger. 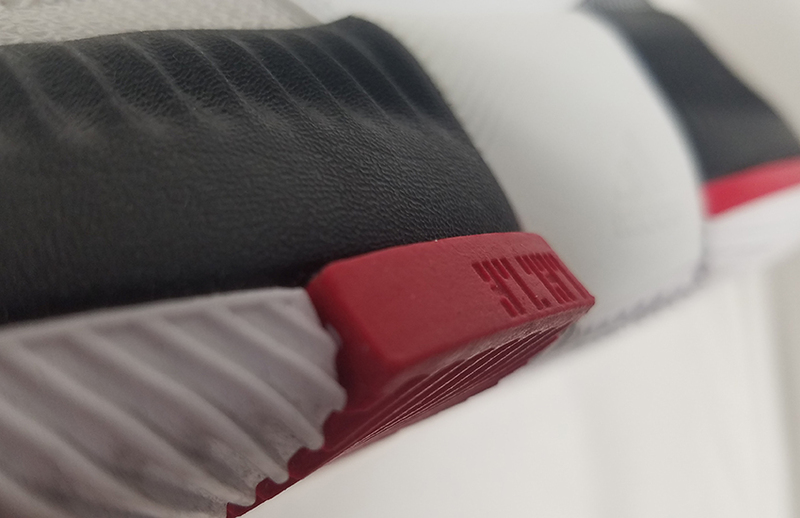 The sum of it means the foot never tips over the outsole at all on the Dame 3. Another highlight of the Dame 3 is its containment. The entire midsole is raised to keep the foot in place on hard cuts. My foot sits about midway between the black portion from heel to toe. In addition, fused areas of the mesh keep the material from stretching, while the synthetic pegboard also adds with midfoot containment. The Dame 3 feels like a progression of the line. It retains a few aspects of the Dame 2 shoe, and adidas did its best to improve on the predecessor’s shortcomings, namely the traction and cushioning. The traction is definitely a noticeable improvement. While we liked the cushioning, others might not like how adidas went with a firmer Bounce setup. 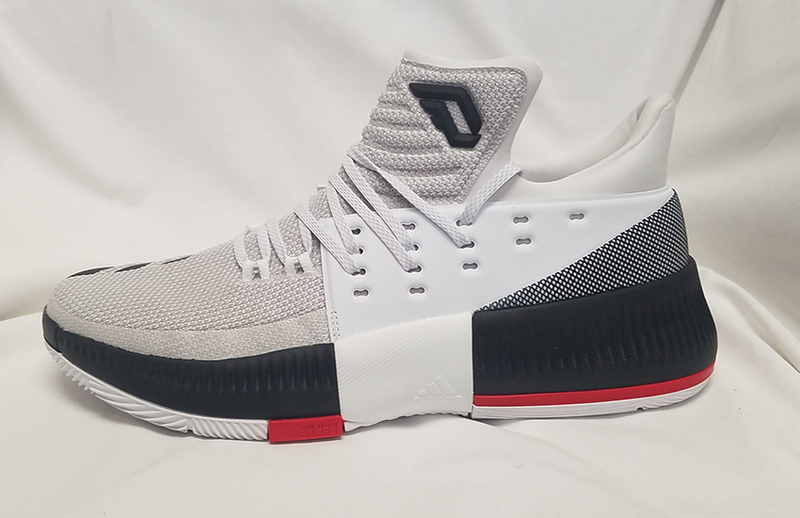 The Dame 3 has its share of annoyances—the slight heel slip, overdone lacing setup and laces that were too short unless a hole was skipped—that negated the big improvements. Another drawback is the heaviness of the shoe. At about a pound, they feel a bit lead-footed. A Boost-version of the Dame 3 would be interesting, if only for the weight-savings, but that would make it an entirely different shoe. As a signature offering, adidas did an admirable job of making the Dame 3 stand out. At $115, it’s the lowest priced model that has an athlete’s name attached to it. Also, much like the player it was made for, the Dame 3 does stand out in adidas’ basketball roster. In a Boost and Primeknit-filled climate, the Dame 3 is as original as his lyrics are. Given a choice, I feel the Lillard 2 is a better balance of comfort and performance, plus it can be found for many Dame Dollas cheaper now. « Gear Check: Nike Kobe A.D.